Jean-Michel Jarre's new album marks anniversary of his debut. 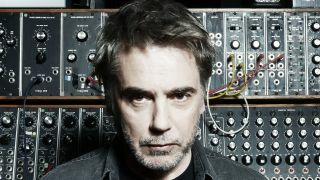 French musician Jean-Michel Jarre will release his new studio album Oxygene 3 on December 3 to mark the 40th anniversary of his landmark debut album Oxygene. Jean-Michel Jarre is fulfilling a trilogy of albums with Oxygene 3, which contains seven newly composed and recorded pieces, consistently titled parts 14-20. “I don’t necessarily like anniversaries that much…But when I was recording Electronica, two years ago, I did a piece of music (today Oxygene 19) that made me think about what Oxygene could be if I was composing it today,” Jarre explains. “Then I took the 40th anniversary of the first album as a deadline to push myself to see if I could compose this new chapter in six weeks, just like I did for the first one. Oxygene 3 will be available on CD, Vinyl and in the Ultimate OXYGENE-Trilogy Box-Set, combining all three Oxygene albums on CD and Vinyl, with an attached coffee-table-book featuring rare photos and notes on the story of Oxygene. Jarre will also tour Europe later this year. See the dates below and his website here.